Sahib and the Crew Save the World: Cavernous Trachea Bombshell! Is Obama the Antichrist? Cavernous Trachea Bombshell! 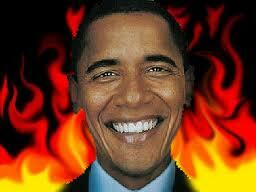 Is Obama the Antichrist? Last night as I was (belatedly) preparing my motorcycle for the riding season, I opened a saddlebag to store my new registration and proof of insurance. In the bottom was a USB flash drive with a note attached. It said: "Dear Sahib and The Crew, I have gone to great lengths risking life and limbs to provide you with this audio recording of Dear Leader Obama and his inner circle. Please share this with your readers. The world must know! Your friend, CT." I immediately contacted The Crew. Below is a transcript of what we heard. It is truly terrifying. BHO: Welcome everyone. Before we get started, what does everyone think of my new tat? What? Isn't it obvious? It's Warren Buffet and George Soros making out. Pretty cool huh? It isn't fair that income tax is the only tax that is progressive, so we are making all taxes progressive. Charitable contributions to groups and organizations deemed discriminatory will be taxed. The people making the charitable contributions will pay the tax, not the group or organization receiving the contributions. Financial transactions using currency and precious metals is out-dated and difficult for us to track. I am eliminating physical US currency and making private ownership of precious metals illegal. Those are the basics. We increase the number of people dependent on government support and play on their class envy by showing we are making the rich pay their fair share. This will also choke off funds to groups we find offensive and cause them to fade into oblivion. The masses will love it! We'll be in power forever. Questions? Yes Tim. Treasury Secretary Tim Geithner (TG): I get the gist of your plan, but am a little concerned how you plan to implement it. Does everyone get like a government debit card that has their tax bracket and access to their financial accounts? If so, how do we keep rich people from paying poor people to buy stuff for them using their lower bracket cards? Also, what kind of groups would be considered "discriminatory"? BHO: Excellent questions Tim! This is the beauty of my plan. There are no cards. Each person has a programmable chip with their information embedded in their right hand. If they don't have a right hand, it's embedded in their forehead. No person-to-person financial transactions are allowed. All payments for goods and services go through a federal transaction system. Any suspicious transactions will be flagged and investigated. Violators will be imprisoned. As to your question about which groups would be considered discriminatory, the usual suspects. You know the Boy Scouts, evangelical Christian denominations, the Salvation Army, the RNC etcetera, etcetera. Anyone else? Yes, Hillary. Secretary of State Hillary Rodham Clinton (HRC): I'm a little concerned about public response to your plan. Having been often referred to as Lucifer's mistress, usually by Bill but by others as well, I am uniquely sensitive to certain religious parallels being drawn. Aren't you worried about people referring to the chips as "the mark of the beast"? BHO: I'm sure there will be a few religious whackos that will make that comparison, but it's not like we're making everyone get 666 tattoos. (Another chuckle) Next question. Yes, Debbie. DNC Chairperson Debbie Wasserman-Schultz (DWS): How did you come up with the plan and what are you going to call the new federal agency to oversee it? BHO: The plan was told to me by the voice behind the glowing red... I mean I thought of it myself. The new agency will be called the department of State Annuity Transactions And Numeration. Well, that's enough questions for this evening. We'll iron out the details later. Stanley's (Obama's unicorn) been waiting patiently this whole time for our evening ride on the South Lawn. I'm surprised they didn't mention the TOFF program (Take Over Family Farms). Maybe they didn't want to divulge too much. And...Sahib has a motorcycle? Do the Sahiblets ride? Don't worry, you'll being seeing edicts from the department of S.A.T.A.N. on SACSTW in the future. Yes they do ride. The older one hangs on with a death grip. I have to holler at the younger one to even hold on.